If you're looking for a way to carry your equipment and food with you on your bike but don't want to use handlebar bags or panniers, cycling backpacks are the perfect solution. In most cases, it will be possible to equip your bike with saddle bags, even if you're planning an off-road ride with your mountain bike. However, saddle bags merely provide enough space for the most important breakdown equipment. If you want to take a second set of clothes or something to drink with you as well, the rather small bags under the seat won't suffice. High-quality cycling backpacks have another important advantage. Unlike panniers, they don't affect your driving behavior. Therefore, suitable cycling backpacks and hydration backpacks certainly are better solution for mountain bike or road bike trips. 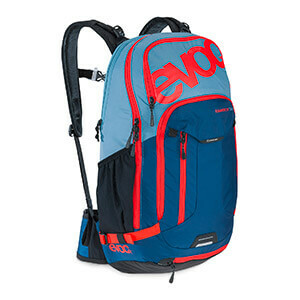 Manufacturers like Evoc, Ferrino, Scott, and Deuter have major experience and know exactly what characteristics a cycling backpack should have. From minimalistic lightweight road bike backpacks for hydration system, arm sleeves, cycling leg sleeves, and energy bars to robust protector backpacks for downhill and enduro cyclists. Since cycling backpacks are not designed for major loads and the cyclist will start to sweat during the ride, back ventilation is even more important than a thick waist belt! Your sitting position affects the requirements for the carry system. Of course, cycling backpacks have shoulder and back pads and are correspondingly comfortable to wear. When riding your bike, your body posture will be fundamentally different than while hiking, which results in less space around your hips. Moreover, your freedom of movement must not be affected while pedaling. Therefore, a chest strap or hip belt will suffice to keep the backpack in position and provide you with the necessary mobility. 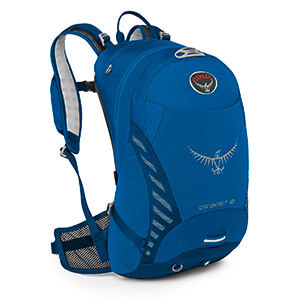 Like hiking backpacks and daypacks, good cycling backpacks come with a well-designed system of inner pockets for you to carefully stow all your equipment. It is recommendable to use a stuff sack in order to organize the space for equipment even better during several-day bike trips. Wet clothing compartments are also very practical and keep your change of clothes dry. Cycling backpacks also stand out for their integrated hydration tube port, which makes them usable as hydration backpacks as well. The only difference is they provide enough space for additional equipment. Cleverly designed cycling backpacks also come with useful extras such as a helmet carrier or a lock holder. Some designs include individual tool compartments. The perfect solution for keeping allen keys, wrenches and other important items handy and separated from the rest of your equipment. Reflective elements outside your backpack and an additional mounting option for a flashing light promote passive safety. The same applies to the mostly brightly coloured rain cover. Some manufacturers equip their cycling backpacks with stable, CE-certified spinal protectors also approved by the German Technical Inspection Association (TÜV). These designs are also available in long sizes for effective protection. If you want to take your backpack off-road anywhere, this solution allows you to optimize your personal safety.